MINOS, MINERvA, NOvA and HALO. MINOS detectors construction and operation, MINOS cosmic ray and neutrino cross-sections analyses, MINERvA test beam and NOvA DAQ. Neutrino detection, particle astrophysics and neutrino interactions. 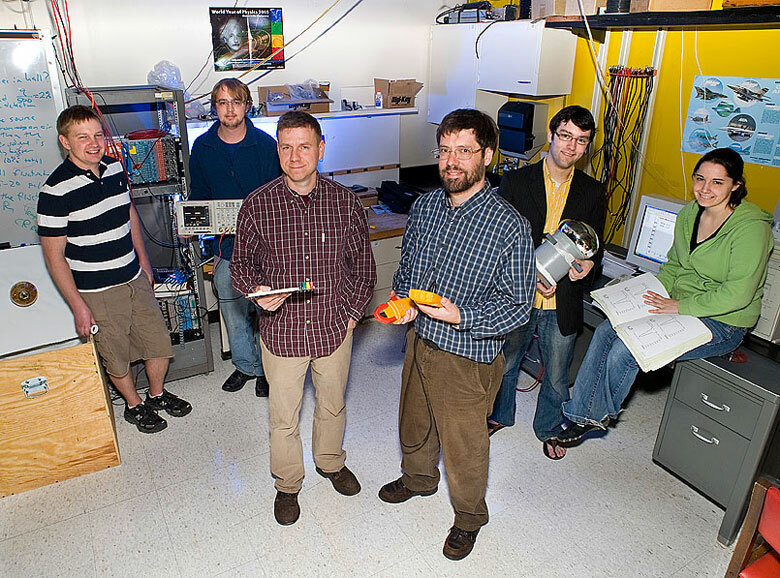 WHAT SETS PARTICLE PHYSICS AT THE UNIVERSITY OF MINNESOTA DULUTH APART? Being a primarily undergraduate institution doing experimental high-energy physics. Younger students get a lot of experience and make valuable contributions before they even get to a Ph.D. program. 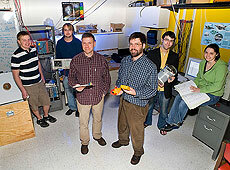 Left to right: Ryan Trogstad, Cody Rude, Rik Gran, Alec Habig, Jordan Heaton and Emily Draeger in the electronics laboratory at the University of Minnesota Duluth. Photo by Brett Groehler.